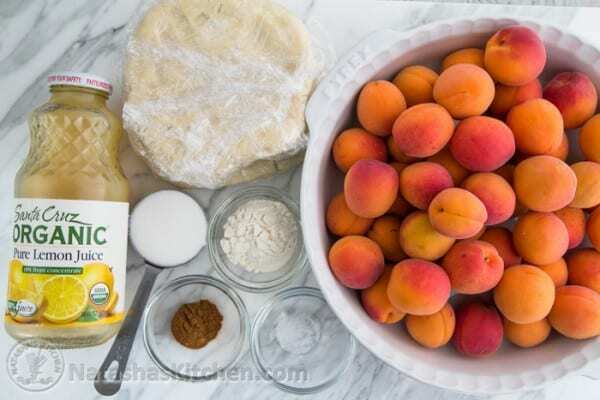 Apricots are one of the few fruits that taste so much better when you cook them. They are especially amazing when you catch them in season. There’s also something magical about pairing them with cinnamon and a squeeze of lemon juice. 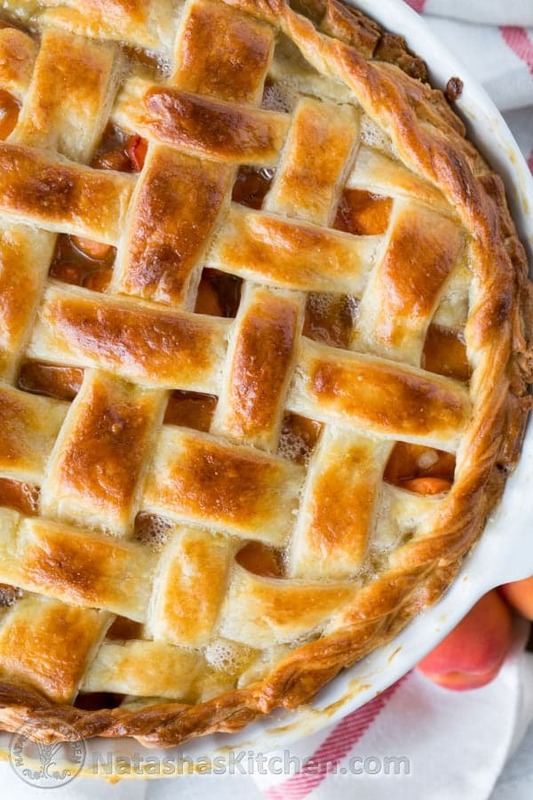 This apricot pie will make your taste buds dance. It reminded me of Christmas and that beautiful baked pie and pastry dough aroma that filled the kitchen… Ooh dear I want another slice badly! I love that this apricot pie wasn’t overly sweet, which only means that a scoop of vanilla bean ice cream on the side was less guilty. I guess I’m craving Fall, but I’m not done with Summer. Nope! Not even close! 1 recipe for Flaky Cream Cheese Pastry Dough (creates the top and bottom of the pie). 1. 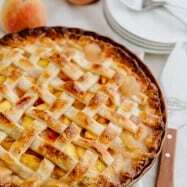 Once apricot pie crust has cooled in the fridge at least 1 hour, and you are ready to use it, remove dough from the refrigerator and on a large sheet of parchment paper, roll it out into a 13-inch circle, sprinkling lightly with flour to keep the dough from sticking to your rolling pin. 2. 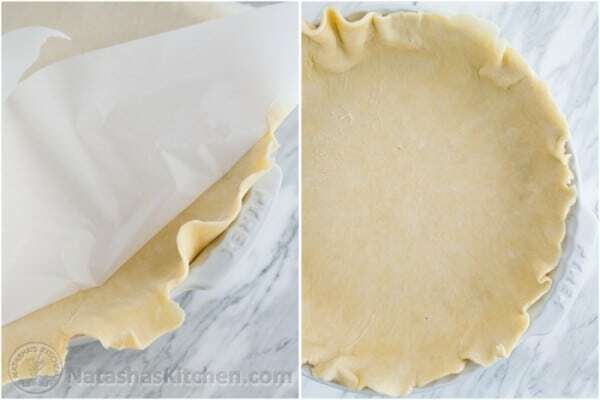 Transfer the dough to a 9-inch pie plate (the parchment paper makes it easy to transfer the dough; just put the rolled dough over the pie plate and peel off the paper backing. 3. Take the next piece of dough out of the fridge and re-using the parchment paper, roll it into a second 12-inch circle. Use a pizza cutter to slice the second rolled dough into about 15 (3/4-inch thick) strips. Set aside until ready to use. 1. Stir together the dry ingredients in a small bowl: 1/4 cup sugar, 2 Tbsp flour, 1 tsp cinnamon and 1/8 tsp salt. 3. Transfer prepared apricot filling into the bottom of your pie pan which should be lined with pastry dough. 4. 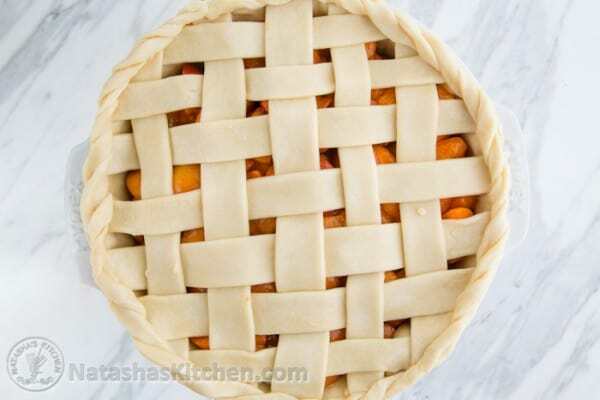 Use the strips of pastry dough to create a lattice top and crimp the edges. 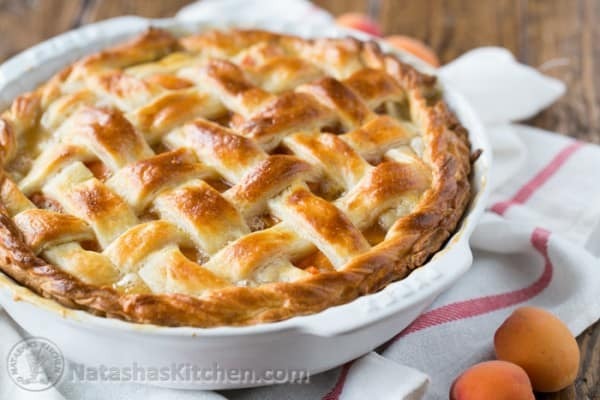 Click here to view the full photo tutorial on how to make a lattice pie topping. I’ve made it easy for ya! 5. Crimp together the edges or use the leftover lattice topping scraps to make a fancy woven border; just make sure to push the border down onto the pie or it will disconnect from the pie and pieces of it will fall to the bottom of the oven and turn black (not that I’m speaking from experience ;)). 6. Beat together 1 egg with 1 Tbsp cold water. Brush top and edges of pie generously with egg wash.
7. 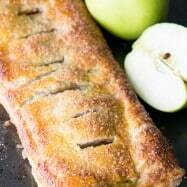 Place pie on the center rack and bake at 425 ˚F for 20 minutes then place cookie sheet lined with foil under the pie to catch any drips then reduce oven to 375˚F and bake an additional 30 min until your filling is bubbling. Loosely Cover the top of the pie with foil if it is starting to brown too quickly. 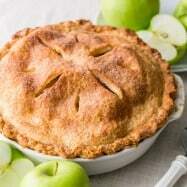 Once pie crust has cooled in the fridge at least 1 hour, and you are ready to use it, remove dough from the refrigerator and on a large sheet of parchment paper, roll it out into a 13-inch circle, sprinkling lightly with flour to keep the dough from sticking to your rolling pin. Transfer the dough to a 9-inch pie plate (the parchment paper makes it easy to transfer the dough; just put the rolled dough over the pie plate and peel off the paper backing. 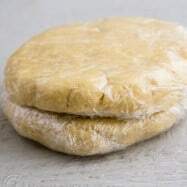 Take the next piece of dough out of the fridge and re-using the parchment paper, roll it into a second 12-inch circle. Use a pizza cutter to slice the second rolled dough into about 15 (3/4-inch thick) strips. Set aside until ready to use. 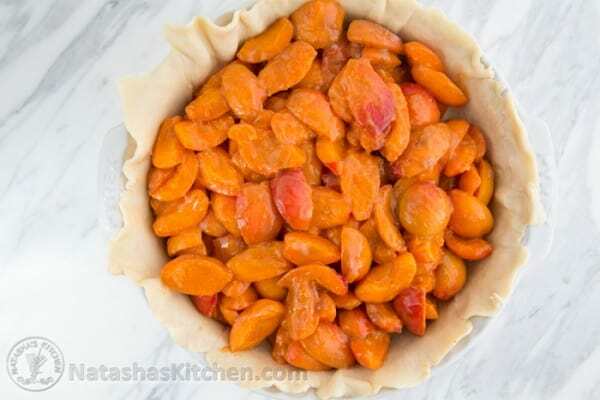 Prepping your apricot filling: Preheat Oven to 425˚F. Stir together the dry ingredients in a small bowl: 1/4 cup sugar, 2 Tbsp flour, 1 tsp cinnamon and 1/8 tsp salt. 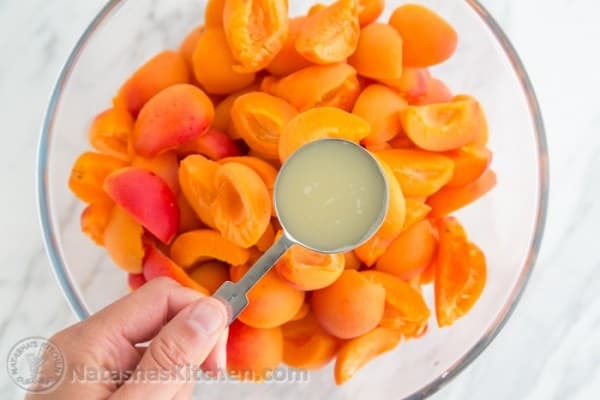 Pit apricots and slice into 1/2″ thick slices and place them in a large mixing bowl. Drizzle with 1 Tbsp lemon juice and gently stir. 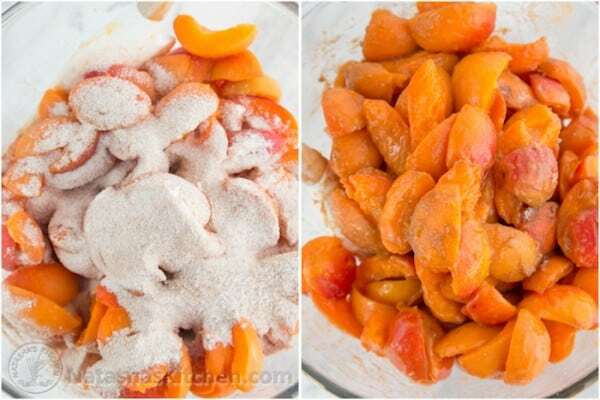 Sprinkle the sugar/flour/cinnamon mixture over the sliced apricots and toss gently to combine. Transfer prepared apricot filling into the bottom of your pie pan which should be lined with pastry dough. 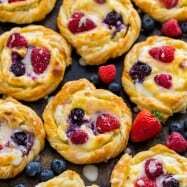 Use the strips of pastry dough to create a lattice top and crimp the edges. 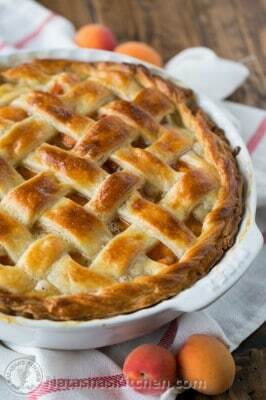 (See notes for full photo tutorial on how to make a lattice pie topping). I've made it easy for ya! Crimp together the edges or use the leftover lattice topping scraps to make a fancy woven border; Just make sure to push the border down onto the pie or it will disconnect from the pie and pieces of it will fall to the bottom of the oven and turn black (not that I'm speaking from experience ;)). Beat together 1 egg with 1 Tbsp cold water. 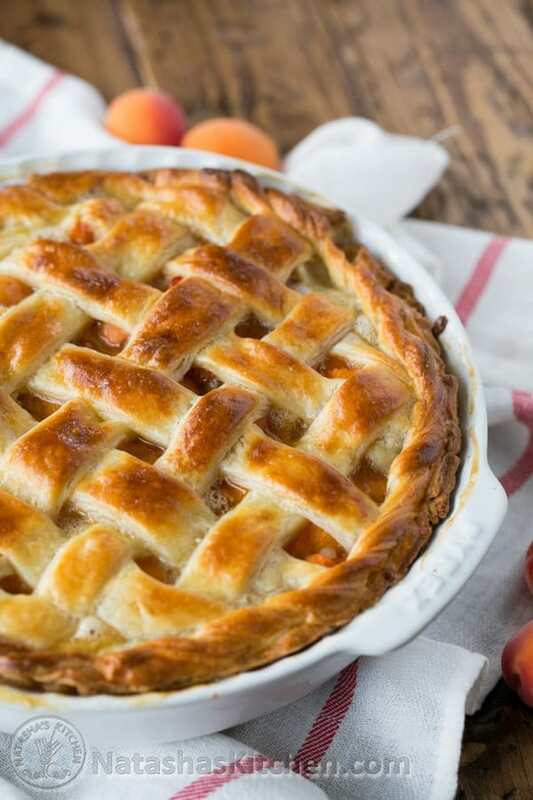 Brush top and edges of pie generously with egg wash.
Place pie on the center rack and bake at 425 ˚F for 20 minutes then place cookie sheet lined with foil under the pie to catch any drips then reduce oven to 375˚F and bake an additional 30 min until your filling is bubbling. Loosely Cover the top of the pie with foil if it is starting to brown too quickly. Here’s the tough part: let the pie cool down ideally at least 2 hours so the filling thickens. 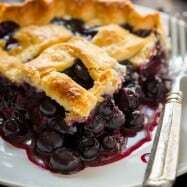 If you cut it early, the pie will be too juicy and will fall apart on your plate if eaten right away. It will still taste amazing, but it firms up as it stands. Yesterday I bought apricots, which were quite sour 🙁 and a bit pricey a may add. So thinking of what to do with them, I came across your recipe. I know! It’s really bizarre. It got a little less sour after sitting in the fridge these past two days, so I am able to eat it! Before it was just waaaay too sour for me.